Last weekend, some friends and I went to Red Cone Pass south west of Denver. Unfortunately K was still in San Diego, so it was just Furry B and me on this trip. This 4×4 trail is considered moderate and the views are some of the best on any front range trail I have been on to date. We met at the Aspen Park shopping center in Conifer, fueled up and headed down the road. The group consisted of two 100 Series Cruisers, an 80 Series and an FJ40, so it was a pretty good representation of the Land Cruiser family. 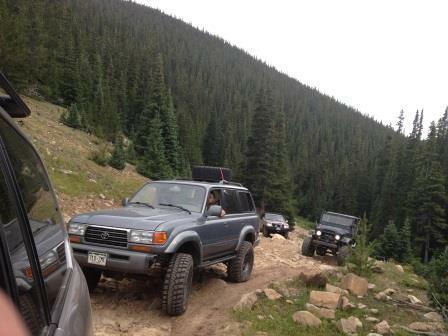 We aired our tires down soon after we left the pavement and headed up the trail. Clouds were looming overhead and we hoped for some clearing as wet rocks are no fun. Immediately the trail narrowed with lots of loose rock and we arrived at our first obstacle. All of us crawled over the rock in the middle of the trail with no problem and continued on. Next was the “rock garden” – an area of large loose rocks that you had to carefully navigate which then brought us to a beautiful Aspen grove. Switchback, after switchback we continued up the trail gaining elevation. This trail is notorious for being a tire eater, so careful tire placement was a must. Nearing treeline we could see the surrounding mountains and the clouds finally gave way to bright blue skies. We entered the “meadow” and stopped for snacks and to let the kids and dogs stretch their legs. This was a relatively flat area above treeline and the last stopping point before you make the uphill push to the summit. After the kids and slobbery dogs were worn out, we piled back in the trucks and made our way up the loose rock trail. Finally we made the summit at 12,801 feet and stopped for pictures. The temperature was in the upper 50’s with clear skies, so we couldn’t have asked for better weather. What an awesome panorama. There were even some large snow fields still lingering near the tops of the mountains. As we started our descent, we noticed two white shapes on the trail below. 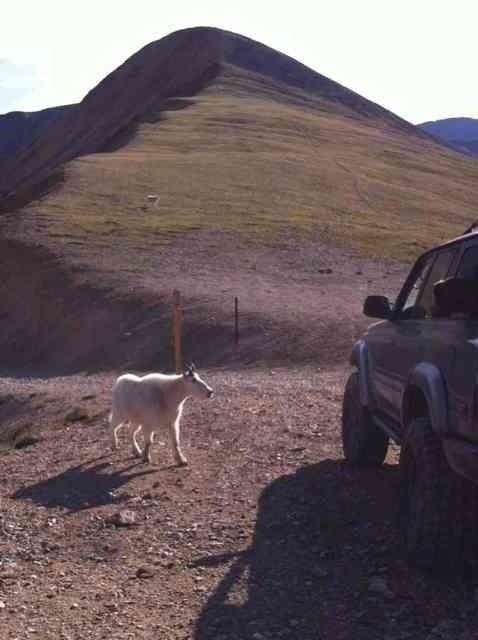 As we got closer, we realized they were Mountain Goats out for an afternoon stroll. We quickly snapped a few pictures as they made their way up the nearby ridge. The sun was beginning to set and the shadows from the mountains slowly crept up the trail. When we finally made it below treeline, we were greeted by some mule deer grazing in a small pasture. Just before sunset, we arrived at the trail-head, aired our tires back up and decided to grab some pizza at JJ Madwells in Conifer before heading home. It was a great ending to an awesome day on the trail.